I am always heartened by the sight of the first snowdrops raising and unfurling their tiny, delicate flowerheads above the iron-hard winter earth, it always makes me think of the approach of Spring, not far off now. 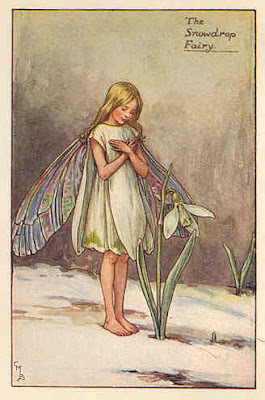 Here are some lovely images I found on the internet to compliment the fabric photographed here, Cicely Mary Barker's Snowdrop Fairy, and illustrations by Millicent Sowerby & Drupsteen depicting the Brother's Grimm fairytale 'Snowdrop', a varient of the Snow White and the Seven Dwarfs tale. The fabric is a beautiful printed cotton chintz, I am not sure of the origin, but most likely English or French. It dates to about 1820-30, and has been block & roller printed by the looks of it. 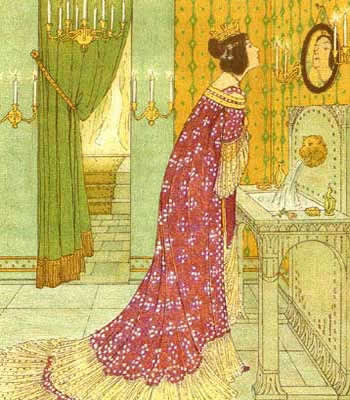 I have a tiny, simply consructed ruffled window pelmet or valance made of it pinned across a little cottage-style window that looks out over the garden. It reminds me that I would like to try to get some snowdrop bulbs for the garden, ready for next year. Oh such a beautiful post with such lovely images. Isn't this textile so pretty in all of its gentle and tender color and design? I could imagine a whole room designed around this one textile. I love the way you have hung it above the window that looks out over the garden. How perfect. I love the fragile delicacy of snowdrops! It doesn't matter how hard the winter, they always seem to peep out at us just when we feel we cannot bear much more of the cold. Like you, I love the tiny design of this fabric, I would love to find more of it one day, perhaps enough for a curtain!